It is very difficult to trace back the origin of fish and chips precisely. However, we know that chips (‘pommes frites’ in French) arrived in Britain from France in the eighteenth century. It was first mentioned in a recipe book called Shilling Cookery in 1854 when a chef included ‘thin cut potatoes cooked in oil’. As far as fish is concerned, it first appeared in Charles Dickens’ novel Oliver Twist published in 1830 at a time when fish warehouses sold fried fish and bread. It is believed that the first ‘chippies’ (fish and chip shop) settled in Lancashire in the North and London in the South of England. 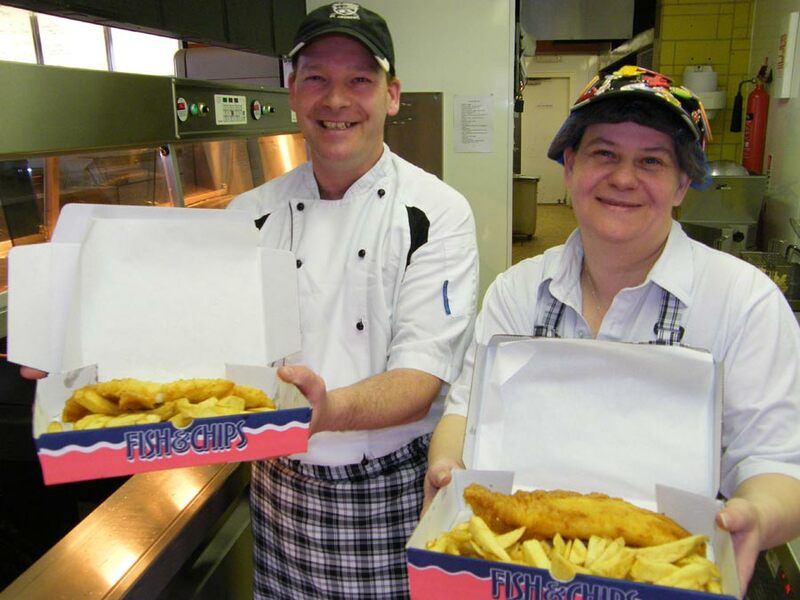 The fish and chips trade grew massively to feed a rapidly expanding population: in 1995 the FFF (Federation of Fish Friers) claimed that the British consumed 300 million servings of fish and chips in that particular year, which represents around six servings for every man woman and child in the country. The record for the most servings sold in one day is over 4,000. Fish and chips were also helpful to feed the masses during the First World War and were one of the few dishes not to be rationed in the Second World War. Hardly anyone can cook fish and chips at home but if you want to cook the perfect fish and chips you want to use the next ingredients. Five essential ingredients play a major role in the cooking of traditional fish and chips. The first and most important element is fish. Different sorts of fish are used in fish and chips recipes but the British’s favourite one is definitely the Cod. UK’s other favourite ones are haddock, whiting, skate and huss. However, the fish would certainly not taste the same without the batter. The batter is a mix of flour, oil, beer or lager and egg that gives a crispy coating to the fish once it has been fried. The second main ingredient in a fish and chips recipe is the potato. People tend to use floury potato instead of waxy potato in order to prevent the chips from becoming too greasy. It is said that one British potato out of four becomes chips. Surprisingly enough, thinner chips absorb more oil and are thus less healthy than thicker ones. Another essential element is the fat, which you fry your fish and your chips in. The traditional fat was the beef dripping but it has been replaced by vegetable or corn oil, which are more suitable for vegetarians. And last but not least, the malt vinegar. It is used at the very end of the cooking and is sprinkled on the chips. This vinegar is made from grain and gives a hearty taste to the chips. 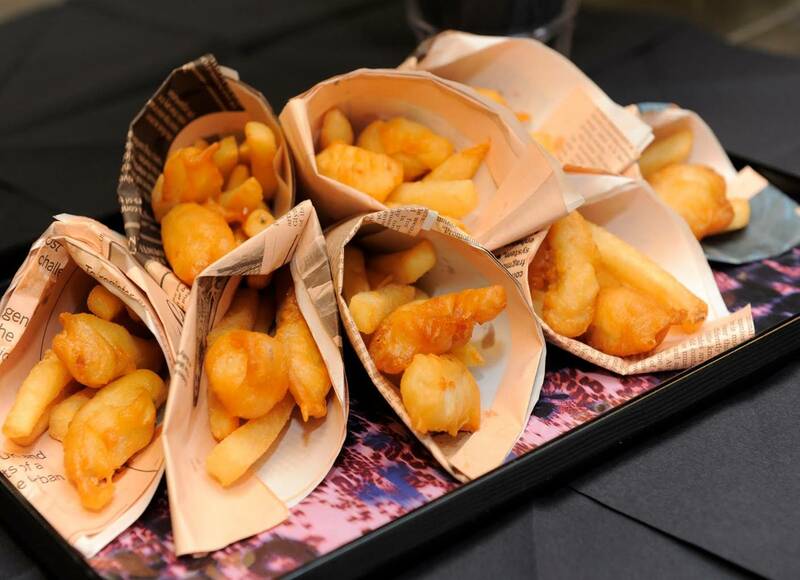 In brief, fish, batter, chips, fat and vinegar are the essential ingredients that constitute traditional fish and chips. United Kingdom is one of the major fish and chips vendors, along with Australia, New Zealand and North America. In New-York city, for example, there are four fish and chips shops in town. According to the ‘Fish&Chips Facts’, the English outlets sell roughly 25% of all white fish consumed in the United Kingdom, and 10% of all potatoes. Tourists who are willing to eat something quick and typical constitute a large part of the consumers. In the United Kingdom there are small local outlets and big chains of vendors where one can eat in place (restaurants) or take away. For temporary occasions fish and chips sell also through mobile “chip vans”. The largest chain of Fish & Chip shops and restaurants in the south of England is called ‘Deep Blue’. Its shops with restaurants are in Horsham, Oxted, Godalming, Cheddar (The Cheddar Fish Bar), Tavistock (The Tavistock) and both locations in Maidstone. Since 1893 ‘Henry Colbeck’ has been the oldest independent supplier to fish and chips shops in the United Kingdom. 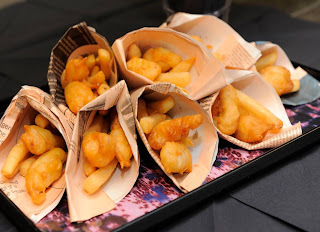 Traditionally vendors might want to serve the fried meal in an inner layer of white paper and an outer layer of newspaper or blank newsprint in order to absorb grease, although after some concerns expressed on the effect of ink on health, some chose to turn to a more basic wrapping instead.